I just went through Magic Kingdom and Epcot looking at food and marked them as my favorites. When I went to favorites magic kingdom was all put together in ABC order not divided by the different lands like Tomorrowland, Fantasyland and Adventureland so when I’m in that area I know what foods places I chose. Needs to be updated especially for those that are on the DDP and need to know what restaurants are 1 credit or 2 credits, otherwise the information is phenomenal. What happened to: Dining for Disneyland app?? Bring it back please!!! I love that it not only gives prices of full menus but includes info on the Dining Plan and lets you input your reservation info! I'm a bit of a control freak and I love this app. I'm choosing the places I want to eat and setting up my visits to be at the right park at the right time. As of October, 2011 an increasing number of Disney restaurants now require a secured reservation (you provide a cc and are charged a penalty if you no-show or cancel less than 24 hrs before). Most restaurants no longer have any walk-in seating accommodations. Warning would have been nice. This has been expanding to all restaurants since Oct 2011. Got this awhile ago. The trip is coming up quickly and I'm finding it very useful. Have my ADRs already input. Also have my counter service preferences saved in favorites. Love the menu link. Seems to be accurate when I compare the menus to other sources. Love the app. This program is helpful, factual and easy to navigate. When you are looking for a restaurant, this app lists all restaurant by park and within parks, by table service, fast service or snacks. 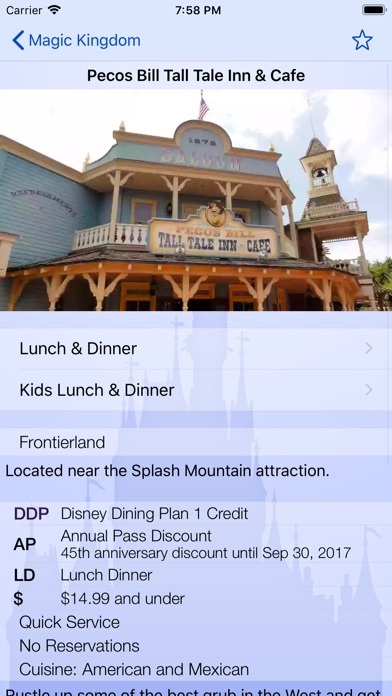 It also provides full menus and price points and Disney dining plans, etc. for a family looking for a place to eat that satisfies every age and taste. Don't leave home without it! Huge part of my Disney trip planning. Better than a lot of websites! Good app, and they update it pretty frequently. It would be great if they could include which items have the Mickey healthy check on the menu so when I'm planning my day I have an idea of which restaurants have the healthiest options. I don't have another trip planned to the World for a year, but this app helps me feel like I'm there all year round. Just what I need for Disney! Great food but the Rib Eye is no longer on the menu. Please update, I was looking forward to it!!!! Best Disney dining app ever!!!! Love it!!!! We can view the menu options & prices when planing our vacation. It's like starting our vacation months early. 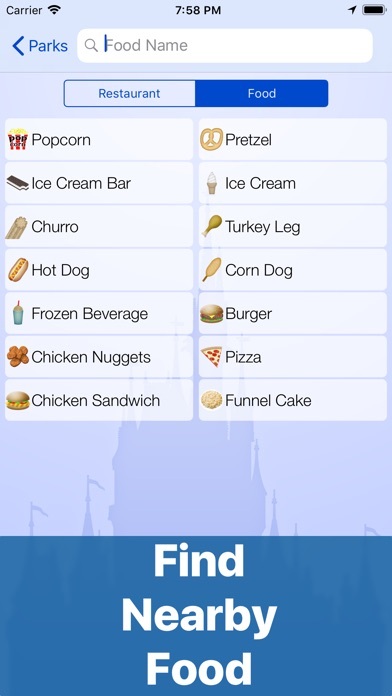 This app is a Disney dining plan must have! Keeps track of reservations, and gives you not only updated menus, but it also gives you prices. Keep records of your favorite places to eat and find food you didn't know they had in the parks. Just used this app to find the Mickey shaped pretzel. It literally pointed the little arrow and counted down the distance. 3...2...1... Look up, there's the pretzel stand. Great ap! However would be nice to be able to book reservations through program. Menu info a ok! It keeps my reservations for my trip and provides menus. Doesn't crash. Can't complain. This app makes my life easier. I am a 17 year old and we go to disney all the time. My family puts me in charge of all the dinner reservations and when I found this app I was beyond happy. It's so Nice! it puts everything in order that way I know what's going on and even gives the you the option to put in the reservation number so I'm not carrying around a bunch of papers. I'll I have is my phone! And let's face it I'm a teenager it's like another appendage! Very helpful! Worth the price. Nice app with good rates on food and saving reservations. Also good at GPS to a location. 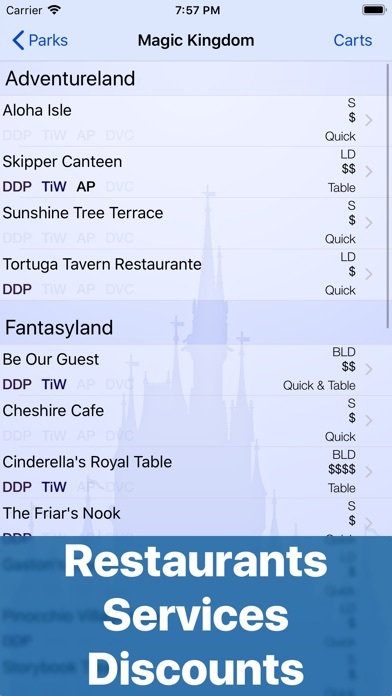 This app not only let's you see the menu, you also can see all the restaurants in each resort/park. It lets you know if it's in the dining plan, tables of wonderland, sit down or quick service. A must have for any vacation, it also keeps track of your reservations and confirmations!!! Why experiment with restaurants only to find out there is nothing on the menu you or your kids like? Could be a wasted walk and your feet need the least amount of walking to save them for the parks. 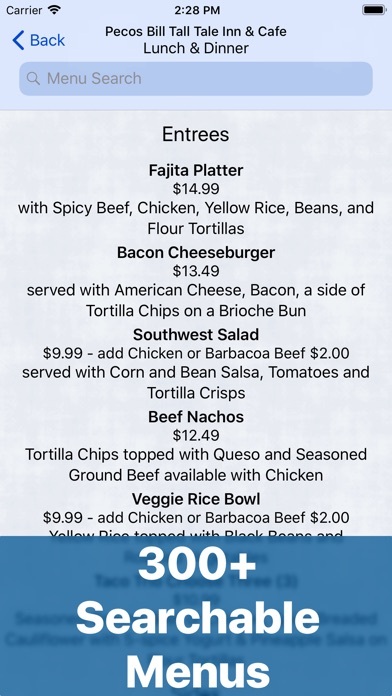 This app makes it easy to see menus and pricing. 5 stars! This app is fantastic! I use it to decide where to eat and than plan my park visits around my dining. I have found this to be a great app and extremely useful. I like this app. Use it to save my reservations mostly. The menus need updated much more frequently!!! Gets the job done. This app is quick, efficient and succinct. Just right amount of information to get me where I want to go. Great app. Very handy. Search all menus for desired food has pointed us to new places we wouldn't have heard of or tried. Also helped us keep everyone happy. Menus appear to be updated regularly. It Just lists the names and gives you the phone number to call. Love this ap. just wish it were updated a little more frequently. Hey don’t mean to come across like I don’t like it. I love it! Especially when I have the dining plan and I need some info. But it does need to update because there are missing restaurants on the app but other than that it’s great. Four star! I love the app now that they finally keep it updated. It helped me plan my dinner reservations for my honeymoon in September at Walt Disney World. I have had this app for 5 years now and have used it for three- our fourth upcoming- trips! It helps so much to determine where we are going to eat, it also keeps track of reservations as well! It is a must have for everyone! A great app to look at restaurants and menus with a load of information. It gives some prices, types of food, types of discounts taken, price ranges, and restaurant operation hours and information. A fantastic tool for the first time visitor to the local cast member deciding on a good place to eat. The only downside is the time it takes to update. Sometimes it is up to date with everything and sometimes there are a few changes to the menu. But then again every app can't be 100% on point. Even apps made by the company can be off from time to time. I highly recommend this app. I am a cast member and I use this app every time I am looking for a place to eat on Disney property. And I will tell others how good this app is. So far I haven't been disappointed. The menus are nice, but need to be updated more frequently. Too long between updates. So easy to use and with lots of info. We use it and tie everything to our magic bands, dining reservations, Fastpasses, what day we will be at what park and the parades and fireworks for those parks. GREAT APP!!! I can review what I want to eat months before the trip, and it is great to help decide what reservations to get, and for budgeting too! I like this app better than Disney's website. This has details of each menu & prices. I'm a well-seasoned Disney goer but I honestly don't know how I ever kept my dining reservations straight before this! Menus, maps and reservations all at your finger tips. Totally worth every cent!! Agree would like to see updated more often. Would also like to see the menu that is available for the Disney Dinning Plan. Most restaurants that accept this plan have a limited menu they offer. Might make a difference for people as to whether or not they choose the plan with their vacation reservations. Accurate menus and prices. Excellent resource. Awesome for planning meals around Disney. Keep in mind though, chefs get tried of cooking the same thing day in and day out, So the menu may change slightly here and there between updates. Also, keep in mind, thus is Disney. It is going to be awesome no matter what u order! I use this app all the time to plan my Disney vacation. I pick out where we want to eat based on the up to date menus and plan my park visits accordingly. This app has all of the features I need, dining plans accepted, menus, prices. Love it. Writing this review while at the park. It is so helpful to find where to eat. My wife bought it for her phone as well. Of all the Disney apps, this is the most useful and easiest to use, in my opinion. Especially if you have one of the dining plans. Really helps to be able to see the menus when planning your trip. Wish you could easily link to your reservations. The new "My Disney Experience" links to reservations, and I recommend you get that too, but this app is better for exploring your choices. Paid two dollars for this app, only to find out it's a free sub-section of the free disney app. Don't pay for this. It was a bit quicker having reservations but we noticed that a good many of these restaurants are SO streamlined (fewer menu entrees, etc) that they seem to get everyone in in a reasonable amount of time. We're real foodies, and didn't mind spending huge sums IF the food was noteworthy. Our thumbs- up go to 1)the Flying Fish, 2)Kouzinnas, 3) FultonsCrab House, 4)Maya Grill. Planet Hollywood was a nice surprise too. Chez France was disappointing. This ap kept it all at our fingertips! I love going to the signature dining restaurants to Disney world. When I'm not there I like to looking at the menus. However I'm going to Disney World in a week and I love planning out what I'm going to have before hand so I'm not awestruck by the menus and have to make a decision in a few minutes. Unfortunately there are missing restaurants. Would be more useful if dining info was updated more frequently especially with all the changes that are being made by Disney. As an Orlando resident, I find myself visiting Walt Disney World quite a bit and, no matter how many times I've gone, I'm always looking for new dining experiences (quick service and table service) to try out at the theme parks and 20+ resort hotels. This app is always my go to app for that because it's designed in such a sleek and simple way. Everything I need to find - from menu offerings to prices - is readily available within seconds. I also love that the developers are fast to update the menus anytime Disney changes something. For $1.99, it's well worth it and I can't recommend it enough to friends and family. Great but needs updating !!!!! Great app, not only has all the menus but lists all the discounts available at each restaurant. No frills app with no complaints from me. I use it daily when planning and at the parks. Sometimes the info can be a little out of date or the time is missing but I usually just need a basic idea. We've used the DL one too! So, so, so helpful!!! Love this app!!! I am no fan of ads in any sort on a paid for app. I updated this app and now every time I open it, it says this app is discontinued and gives me an ad for a free update to a replacement app. I dialed into the new replacement program called Magic Guide but it is asking for money to get rid of the ads. So my choice is to stick with this app with a large ad for the other app every time I open, or move to the other app and have ads for other apps unless I repurchase with one of those in app purchases. When I purchased this app originally, I had no ads. I’m disappointed that I have ads now and no matter which way you look at it I have to spend money to remove them to continue using this app instead of moving to the My Disney Experience app. I had Disney World Dining just for menus. 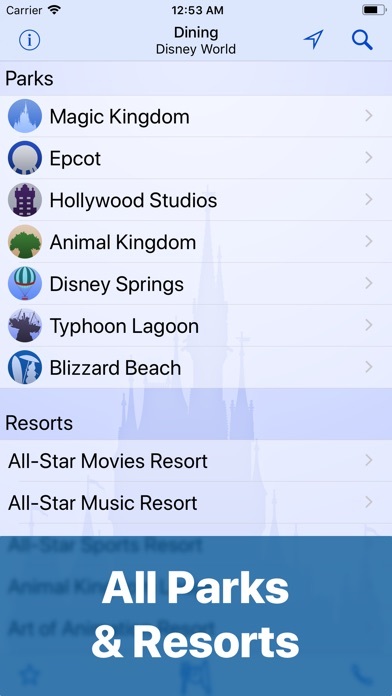 If I have to change apps, My Disney Experience, provided by Disney, will allow me to make restaurant reservations, make fast pass plus reservations, and manage photopass directly from that app. — Developers, I’m not interested in moving to Magic Guide as it has ads that I do not wish to view. It would have been a better move to go to a version 2 of this app and add in IAP for menus for the current year forgoing the addition of ads. Great app although Disney apparently just raised prices, so some items are priced low. We are down at WDW now and many entrees are more than the app shows. Developers need to allow users to confirm prices live. Makes picking out restaurants at the parks easy for large groups. So I purchased this app and when opened it, it immediately said that it was discontinued and to download the "newer" app which is full of ads which is why I bought this one, to avoid the ads. Great information. Great menu detail. Very helpful app. I really like this app. Two items are keeping me from giving it an outstanding rating: 1) there is no indication when each of the menus was last updated. A "last updated" date at the bottom of each menu would be a great addition. 2) adding a Month wheel to the date/time input will make scrolling to a future date much easier. Scrolling through six months, one day at a time, for a week's worth of reservations is a pain. Other than that, a great app!